The pedestrian detour on the Liberty Street Bridge. The Liberty Bridge has survived many years of pedestrian traffic, not to mention the events Sept. 11. Starting today, daily users of the bridge will be forced to follow the new pedestrian traffic patterns. 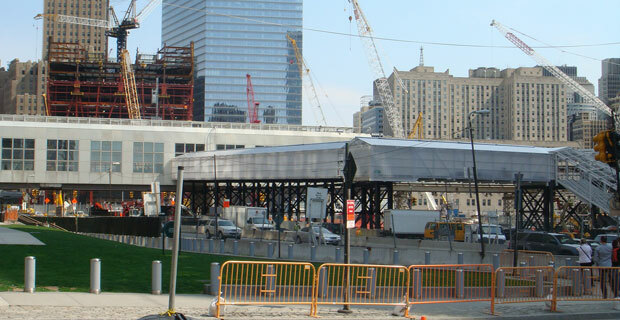 The Port Authority has commenced construction on a pedestrian detour that will take people off the side of the Liberty Street Bridge and stretch all the way to Church Street on the east side of the World Trade Center (WTC) site. Traffic patterns are changing to accommodate for the construction of a new underground parking facility. The annex and pedestrian detour will add some time to your daily commute, but will ultimately help commuters to completely bypass crossing the 16-acre WTC construction zone.